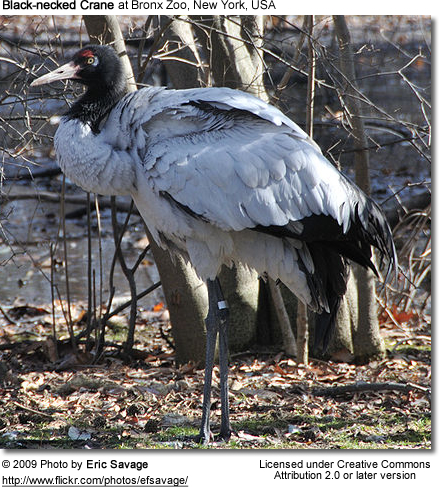 The Black-necked Crane (Grus nigricollis) is a large, whitish-gray crane. 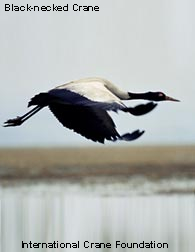 It is also known as Tibetan Crane. It has a black head and upper neck apart from a whitish postocular patch (bare skin patch behind the eye) and red crown patch. It has black primaries (longest wing feathers) and secondaries (shorter, upper "arm" feathers). Tibetan Plateau, with a small population in adjacent Ladakh, India. Breeds near the High Altitude Lakes of Ladakh such as Tso Kar lake. Estimated to be between 5,600 and 6,000 individuals. Current thrats include the cultivation of its breeding grounds and the opening up of the Ladakh valley to tourism. 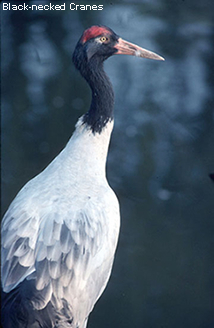 This species is legally protected in China, India and Bhutan.